For an "Easy Fast” Experience on Yom Kippur make sure to download a QR Reader app for your phone. 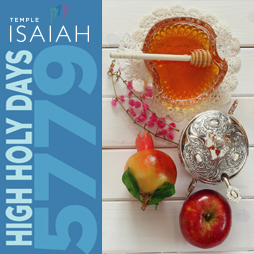 High Holy Days is a particularly special time in which our entire community gathers together for reflection and renewal. Our services weave a beautiful tapestry of sound and speech, both ancient and modern. Clergy lead with inspirational thoughts and sermons aided by congregant voices: Hasharim, our adult choir, and our children’s Pop Up Choir. We offer a contemporary lens through which to view and experience our beloved tradition, inviting worshipers to seek the wisdom and guidance of our ancestors in a language that is familiar and stirring. 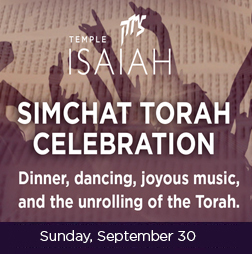 Many of our services (Erev Rosh Hashanah, Kol Nidre, and our Rosh Hashanah and Yom Kippur Morning services), are designed for adults and children 10 and older, and begin with upbeat and soulful prayers. 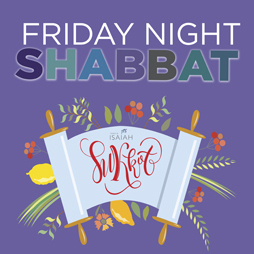 Clergy share reflections on Teshuvah (repentance and return) and Tikkun Olam (our commitment to healing a broken world), and deliver formal sermons that address significant challenges in our lives today. These services speak to the intellect and the soul. We also offer our Family services, gathering early in the day, which attract multi-generational families and those with children 10 and younger. In place of a sermon, clergy present an interactive story with teachings that reach the hearts and minds of every participant. The Pop Up Choir leads us in joyous song. Traditional liturgy finds its place alongside new, creative interpretations and poetry. We have plenty of events to celebrate during this holiday season. 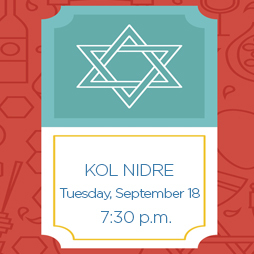 Tuesday, September 18 | 7:30 p.m.